This is a pretty special exclusive for Freo’s View, so I will indulge a little here. I heard only a couple of hours ago that Fremantle independent MLA Adele Carles and Minister for Transport, Housing and Emergency Services Troy Buswell will get married in a secret wedding at St John’s Church in Fremantle’s Kings Square at 9.30 tomorrow. It was by pure accident that I found out. I walked past Little Creatures on my way home from the Wray Avenue lanterns making event, when I noticed Adele’s loyal and lovely office staff Helen and Natacha, and of course went over for a chat. The normally focused ladies were a little under the weather and tried hard to keep the secret from me, but confessed they were part of a hen’s night party. After a bit of probing and a round of drinks, it finally came out that Adele and Troy will tie the knot in the lovely small church, in front of only their closest friends. When I wanted to go in and speak to Adele, Natacha and Helen told me that Adele and Troy would deny it was going to happen, to avoid a media scramble at the tiny church. I can understand that. I admit to feeling a little bit guilty posting this here, but the media don’t read an unimportant small Fremantle blog like this, so I will probably not do any harm by announcing the wedding here exclusively. This is a big coup for me, so I can’t keep it under wraps. Sorry Adele!! I hope to post photos of the newly wed on this blog tomorrow morning after the ceremony, so stay tuned. HOW CAN ONE NOT LOVE LIFE? How can one not love life when the most gorgeous sunsets just happen on one’s door step in good old Fremantle. Comments Off on HOW CAN ONE NOT LOVE LIFE? 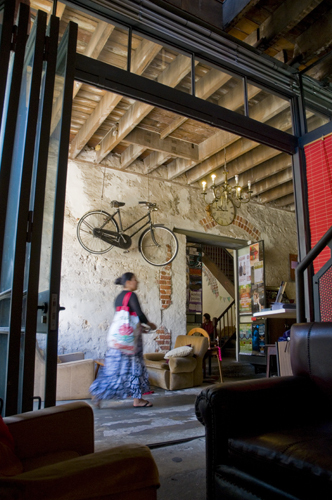 I like Fremantle for all the small community things that happen here, often without many people knowing about them. Heath Adams and the Wray Avenue mob made my day this afternoon. Sitting on a small patch of grass opposite Franks’s the butcher, they were making lanterns for The March of the Lanterns, as part of Earth Hour, which is today.They would all get lit at 8 pm. The City of Fremantle held a Kings Square development workshop for precinct groups this morning, which was a pro-active way of dealing with the challenges of getting it right for our city square. Design Advisory Committee chair Geofrey London was there, as was committee member architect Alan Kelsal, architect Michelle from CODA, city planning staff, councillors and the Mayor, and Matthew McNeilly of Sirona Capital and Chamber of Commerce CEO Tim Milsom. It was interesting to deal with the possibilities and challenges of creating the future square, and it was good to hear such positive comments from Matthew McNeilly, the Myer building owner, who seems very sincere in wanting to do the right thing, and is looking at the bigger picture of revitalising the whole of Fremantle, rather than just wanting to put a big building in the CBD. We did a walking tour around the square that incorporated the cappuccino strip, etc. looking at sight lines, how we can create a better visual awareness of Kings Square, etc. I felt good being part of Fremantle’s future direction, and moving forward with creative people who want to make a difference. There will be an information workshop on April 28 and a community workshop on May 1, so check the City of Fremantle website and local papers. 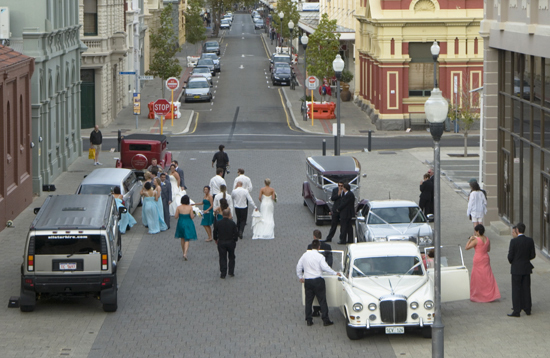 This is photos shows Fremantle at its best and worst. A colourful bicycle on Kings Square marred by an overflowing rubbish bin. Rubbish removal in the inner city is patchy during weekdays and pretty horrible on weekends, and it needs to be improved. The free Fremantle WiFi service FREBytes has been extended to the Moores building in Henry Street. FREBytes now covers Kings Square, High Street mall, Library, Fremantle Art Centre, Fishing Boat Harbour and nearby Esplanade and now also the home of my favourite cafe the Moore&Moore. The free WiFi is very popular with backpackers, tourists and students and is a really good initiative that attracts people to Kings Square at all hours of the day. The Fremantle Network events, organised by Rachel Pemberton, are always worthwhile events to go to, and yesterday’s meeting at Rosie O’Gradie about Kings Square was a very popular one, with the small room packed with Fremantle business people, architects, students, and Mayor Brad Pettitt, and councillors Jon Strachan, Andrew Sullivan and Tim Grey-Smith. Speakers were Adelaide based consultant David Shetliffe, who has been advising the City of Fremantle on how to stimulate economic development and investment for the Kings Square project, and Matthew McNeilly, the managing director of Sirona Capital, the new owners of the Myer building. Mc Neilly was very positive and optimistic about the Kings Square project, saying several quality retailers had expressed interest in moving into Fremantle. He estimated the cost of the project to be around $ 160 million and that it would create 25,000 square metres of office space and 20,000 square metres of retail space. Hopefully the plans for the Myer building shown in projections will change dramatically, as the building shown was just another one of those modern characterless big boxes, that does not acknowledge the existing character of Fremantle and Kings Square. I will be attending this morning’s first public workshop on Kings Square. 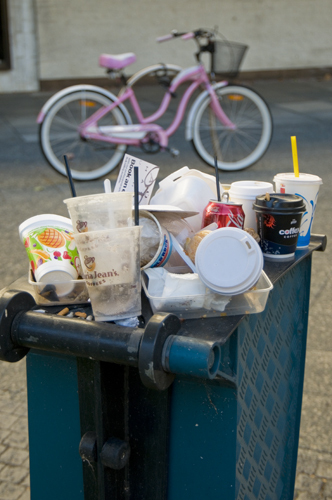 This photo was taken just after six o’clock this morning on Fremantle‘s Victoria Quay. 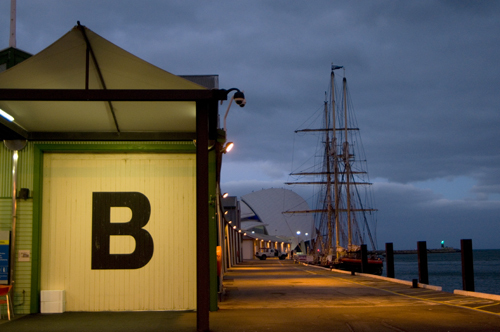 The SS Leeuwin in front of the Maritme Museum and B Shed, with heavy clouds overhead. According to a report in The Australian newspaper the Fremantle Esplanade Hotel has been sold to Singaporean company Ascendas for 90 million dollars. Marilyn New bought the property in 1991 for only 12.75 million, but wanted as much as 120 million for it in late 2010. Will Marilyn New see the sale as a $ 30 million loss or a $ 77.25 million profit? Whatever way, she has now got money to finally renovate the run down Woolstores building she own into a fine and exclusive boutique hotel. I am so relieved! It isn’t me!! I have been wondering if it were my looks, my smell, my age, my bank account, that I live in Fremantle, or the fact I ask a women out for dinner at McDonalds, that made it impossible for me to find a new love in my life, but today’s West Australian cleared it all up. Numbers have been stacked up against me, as Western Australia has nearly 38,000 more women than men.